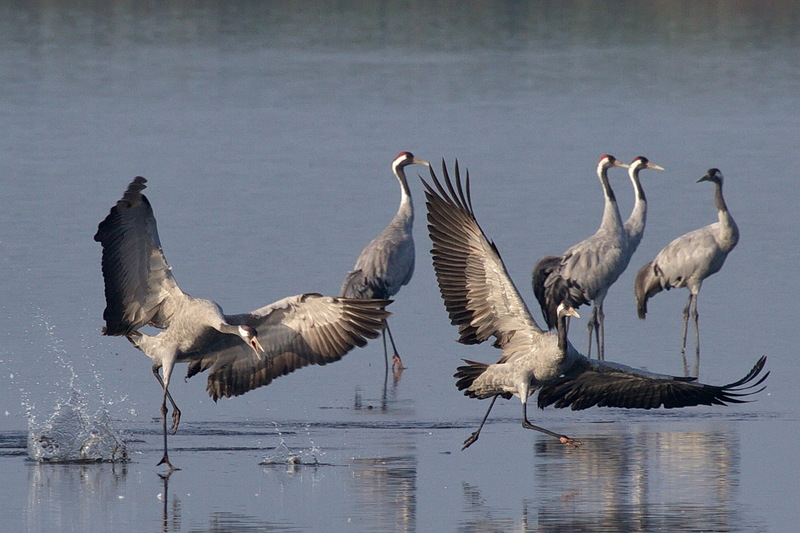 The drought that afflicts the Iberian Peninsula influenced the winter of more than 200,000 cranes. This wintering season was “extraordinarily exceptional”, according to the latest census and may help us understand how the migration of this fantastic bird will change. Carlos Miguel Cruz never counted so many cranes (Grus grus) in Portugal as in this winter: 12,672. “It is a record since the mid-1980s,” when 2,200 cranes were recorded, the National Coordinator of Wintering Cranes counts by the Portuguese Society for the Study of Birds (Spea) told Wilder. Alentejo is the only region of Portugal chosen as a winter destination by the cranes of northern Europe. These are birds over one meter tall, blue-grey plumage and a red spot on the head. They spend winter in Alentejo, in little dense holm oaks, wet areas, little slopes and torrential streams. Here the food is more plentiful and they can better prepare themselves for breeding, a few months later, when they return home. Every year, several entities come together to count these birds in order to find out how many migrate to Portugal and where they are. The 2017/2018 census, made jointly with Spain in December and January, has just presented the results, reaching an Iberian total of 201,630 cranes. “It was an extraordinarily exceptional time,” commented Carlos Miguel Cruz, a naturalist who started counting cranes as a teenager and continues doing so today. But the high number of cranes is just one of the differences from previous years. “This time, the cranes adopted very interesting new behaviours,” he added. This winter registered two new sleeping areas for the cranes – Juromenha / Olivença and Odivelas’ reservoir (municipality of Alvito) -, joining the five already known: Arronches / Campo Maior, Évora, Mourão, Moura and Campo Branco. According to Carlos Miguel Cruz, the cranes already used those two areas sporadically, to feed themselves, and in small flocks. But this winter they began to use them in another way. The drought lowered the water level in river Guadiana and in the reservoirs of Odivelas, leading to the formation of fluvial beaches. “The cranes sleep with their paws in the water. They need areas with shallow water, with no steep slopes and with safety and stability. This winter those two areas gave the cranes the conditions they needed and that they did not find in places they used to use in other years”, he explained. Cranes changed their wintering sites depending on the available water. “Still, our areas maintained some moisture and water, enough to receive the cranes that did not stay in Spain,” explained Carlos Miguel Cruz. The Iberian census also revealed that “there were many more cranes in North Africa, in Morocco, for example. There were also some in France and Germany, which is not usual”. 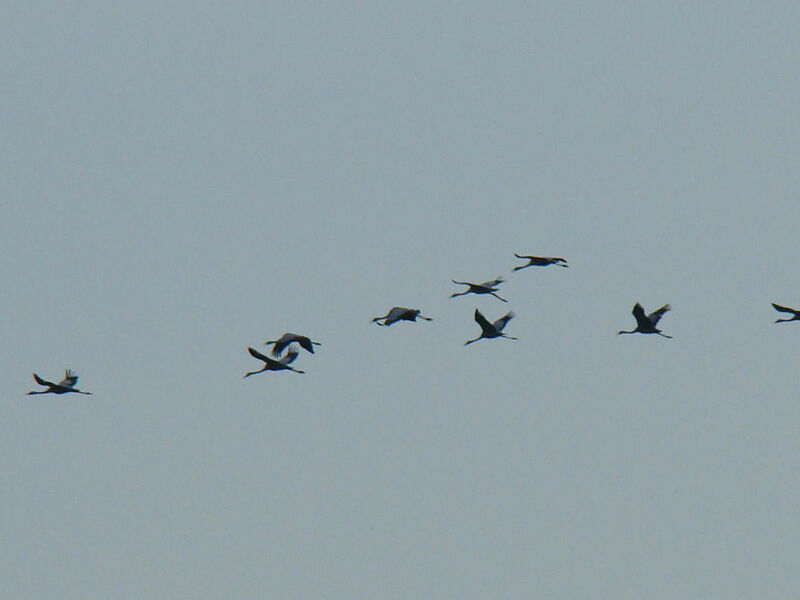 In addition, this year cranes began to migrate earlier, back to Northern Europe. “They anticipated the migration and went looking for better conditions. In some places the migration was anticipated a month.” In Portugal it will be almost impossible to observe cranes after 15th March. 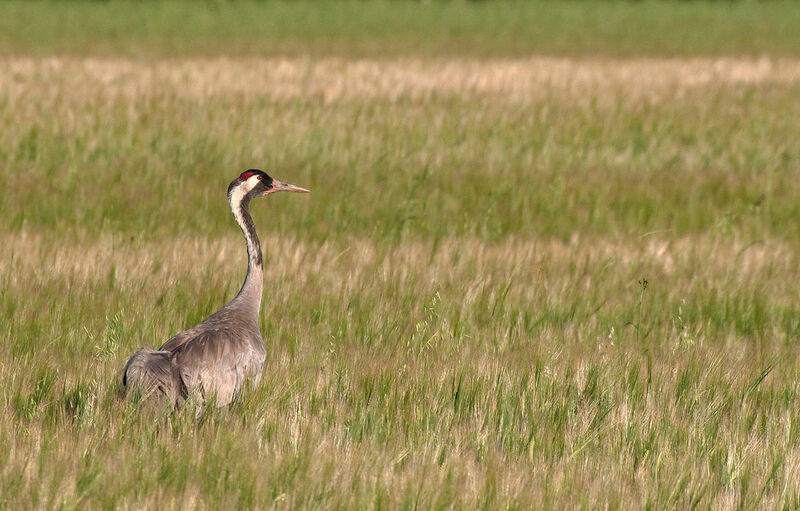 It is not known for certain which are the origin countries of the cranes that spend winter in Alentejo. But this year, people who participated in the census were able to read two bird rings: they were animals from Finland and Estonia. Besides the record numbers and the new winter areas, Carlos Miguel Cruz saw something this winter for the first time. “The cranes were so hungry that they walked behind the tractors that ploughed the soil in the preparation for sowing, looking for invertebrates that were more accessible. It is a typical behaviour of birds such as herons, but I had never seen with cranes”, he said. In fact, there were times when the crane was nesting in Portugal. There are records of crane nests at the end of the 19th century in Baixo Guadiana and Pancas, in the Tagus estuary, according to the book Aves de Portugal (Birds of Portugal) (2010). But the bird has long been only wintering. The annual census of wintering cranes is coordinated by Spea and several entities such as the Liga para a Protecção da Natureza (LPN) and the Instituto de Conservação da Natureza e das Florestas (ICNF). It has the support of the Portuguese Environment Agency (APA) and the Ministry of Education.